The telly clicks off. We've just finished watching the penultimate episode of The Apprentice - the one in which they have to go through a series of grinding interviews. Watching this kind of TV is a lot like eating at McDonalds: You know it's not good for you, and that you'll regret it afterwards - but there is something tragically alluring in there, that keeps taking you back. The other fascination is watching the candidates bouncing off each other in their - mostly undignified - scramble up the greasy pole. You can see similarities between candidates and people you've worked with in the past, and isn't it delicious when they get their comeuppances? One common denominator across all the candidates is their unshakeable belief in themselves. This is a great thing: confident people make us feel reassured that everything is under control and that nothing can go wrong. The problems (and the car-crash telly) start when that confidence isn't supported by awareness: of other people around them, and of themselves. And the producers of The Apprentice are pretty adept at selecting candidates with masses of confidence and zero self-awareness. The best candidates and, funnily enough, the best casting instructors I've met have this superb combination of confidence in their abilities and a finely tuned awareness of what they're doing and the reactions of others. And better self-awareness is what most of us need to improve our casting. ...at least the leader turned over. 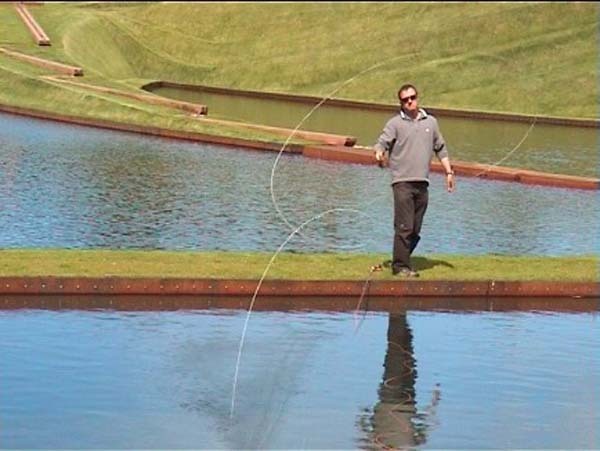 Videoing yourself casting is a real eye-opener, and will improve self-awareness massively. You just need to prepare yourself for not looking remotely like the chiselled, athletic, finely honed casting machine that you thought you resembled. I, for instance, seem unable to cast any distance over 50ft without pulling a stupid face. How am I supposed to concentrate on tracking and longer hauls when all I'm thinking is "don't stick your tongue out, don't stick your tongue out"? I usually have to watch casting videos of myself alone, and through the fingers of my hands. Maybe too much self-awareness is bad for you and a bit of confident ignorance is the way forward after all.